Green Baby Bargains: Little Soles Baby Soles - 50% off! Little Soles Baby Soles - 50% off! Only $15.45! 50% off! Start shopping HERE! Little Soles™ mission is to provide fresh, footprint-conscious, fashion-forward footwear. For those of you clever & conscious consumers seeking stylish, eco-minded alternatives to mainstream fashion. 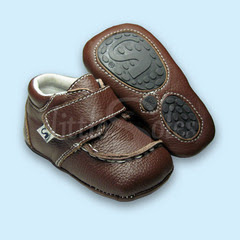 Little Soles Inc. proudly introduces Baby Soles, a new Crib Shoe Collection for sizes 0-2 US. Baby Soles are equipped with TPR inserts at the toe and heel beds for traction and durability. The specialized outsole design provides the added benefit of optimum surface feel for when baby starts to cruise! Overall unique styling presents a true footwear appearance instead of a standard slipper form. iParenting Media Award Winner - "Outstanding Products 2009"
-Little Soles Inc. is socially responsible and environmentally aware of the impact of our company and its products on the Earth. Kind Signs Stroller Signs - 50% off! Peanut Shell Nursing Covers - 55% off! The Safe Sporter by Kid-Basix - 50% off! BumJoy Pocket Diapers - 50% off! Yellow Label Kids Crocheted Blankets - 52% off! Natural Pacifiers by Eco Piggy - 50% off! GroBaby Shell Sets + Soaker Pads - 55% off! Baby Sherpa Diaper Bag Backpacks - 52% off! Safe2Go Child Safety Harness - 50% off!